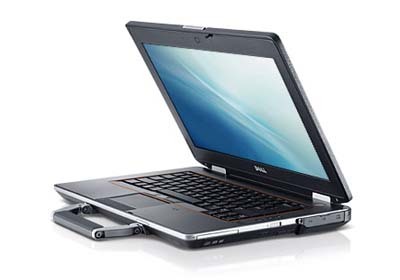 Dell Latitude E6420 ATG rugged laptop helps to boost your productivity while delivering the durability, productivity, security and convenient manageability. This rugged laptop is powered by 2nd genartion Intel Core i7/i5 processor. Latitude E6420 ATG comes with 14-inch HD wide view outdoor viewable display, Mobile Intel QM67 express chipset, optical drive, Dell Wireless 375 Bluetooth 3.0, high quality speakers, four USB 2.0 ports (one USB/eSATA combo), Network connector (RJ45), stereo headphone / microphone combo jack, VGA, docking connector, HDMI, USB 3.0 Module option via optical bay, full HD webcam, card reader, and 54 mm ExpressCard.